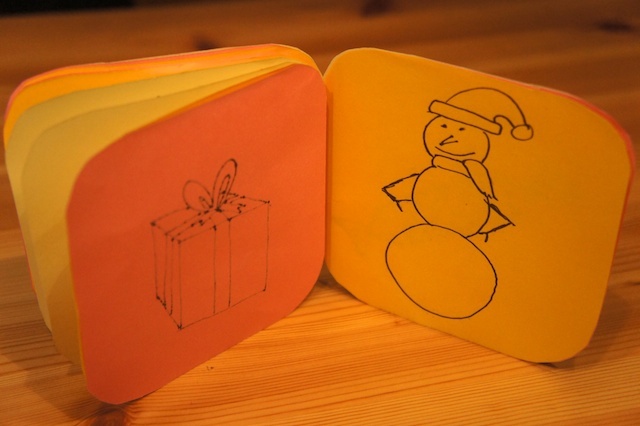 Day 14 – Let me start by saying that as a kid, I royally sucked at bubble letters, my big brother on the other hand was awesome at it. 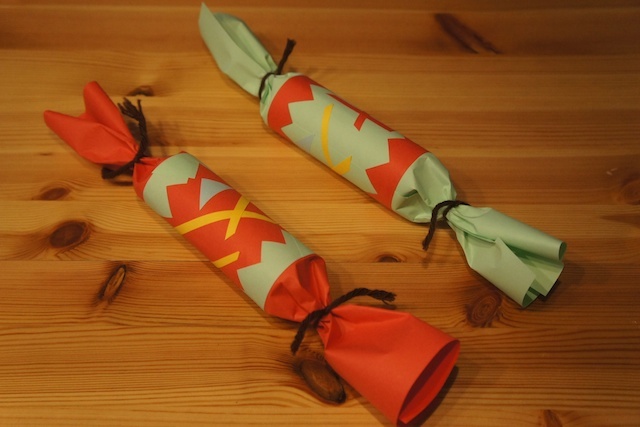 It was likely this way because I tried it once and sucked and gave up on it, whereas my brother probably practiced a bit, or maybe he was born awesome, who knows. All this to say my bubble letters haven’t gotten much better, but I digress…. My daughter loves colouring books, but having the motor skills of a two year old means she can colour a page in about 10 seconds with some excellent scribbles. Because of this she goes through colouring books like crazy. 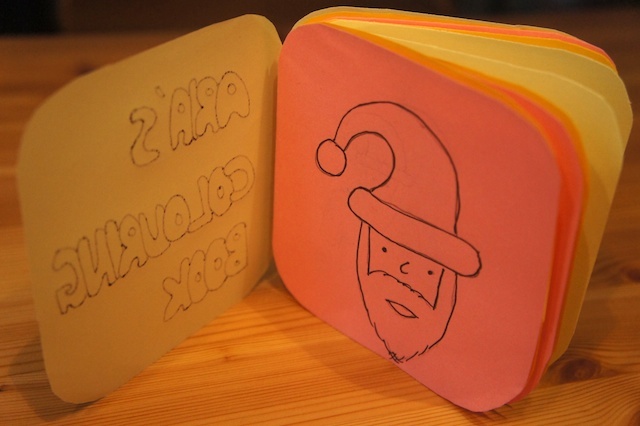 Today I made her a quick little holiday themed colouring book. 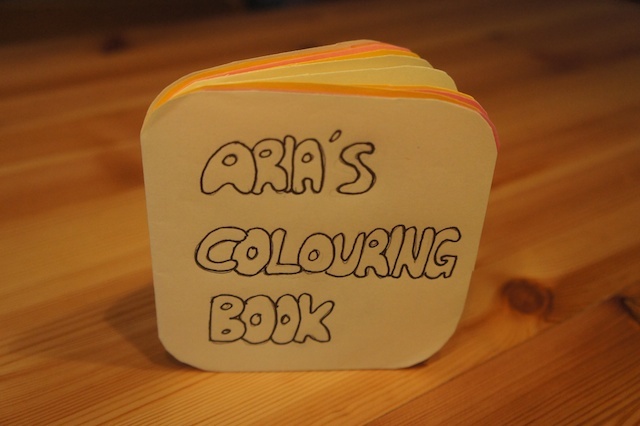 It has 12 pages with 11 different pictures to colour. Now to go and find a free stapler to stick it all together…. 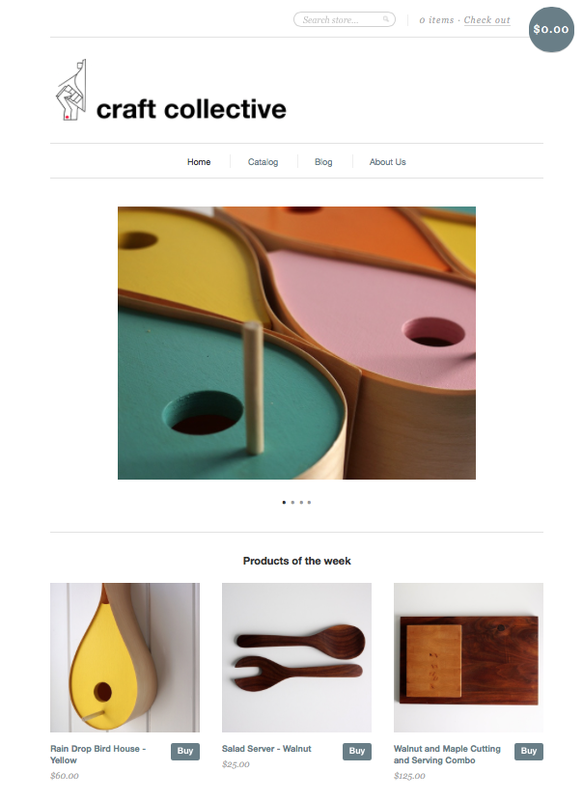 52 Create – my weekly creative output for 2011… This week has flown by! Hence the reason my Tuesday post is appearing on a Friday. Well with the wealth of cutting boards and rifle stocks as of late, I thought I should mix things up and go big. 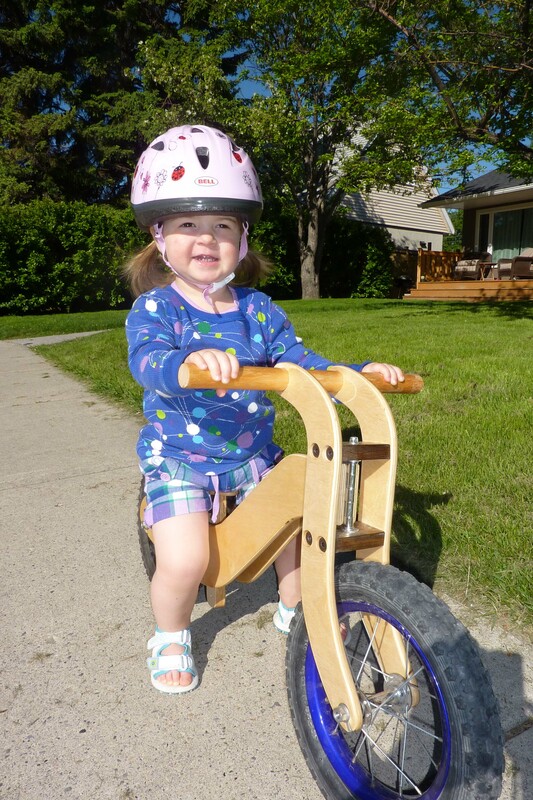 This week’s creative output is a kids wooden push bike (also called a run bike or balance bike). These seem to be all the rage lately and you can spend as much as $300 on a designer model. They are basically a kids bike without pedals, so they use their feet to push themselves along, apparently it teaches the kids excellent balance and helps them to more easily progress to a real bike without training wheels. 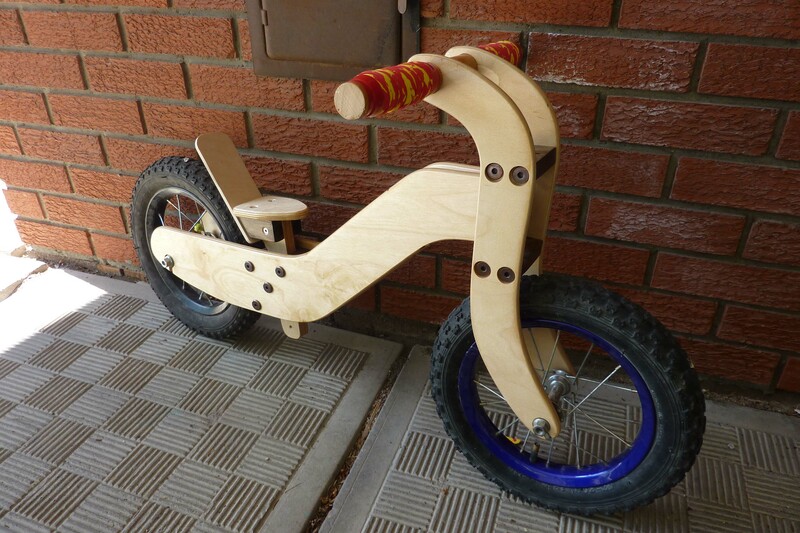 There are suprisingly few diy wooden bikes on the net. There is one how-to with plans out there, but that seemed far too easy for me. So I look at a ton of pictures of these bikes on google images and sketched out my own design. As usual, the wheels were the tricky part. While you can buy a brand new kids bike for $30, to buy a pair of wheels/tires/tubes will run you $90!!! I found this set at a used bike shop for $20 total, they don’t match, but my 21 month old daughter couldn’t care less… The frame is made from my favourite – baltic birch (1/2″) with a wodden dowel for handle bars. I’ve had many comments about the small seat and lack of padding, but my daughter is still in diapers so she has her own “built-in” padding. 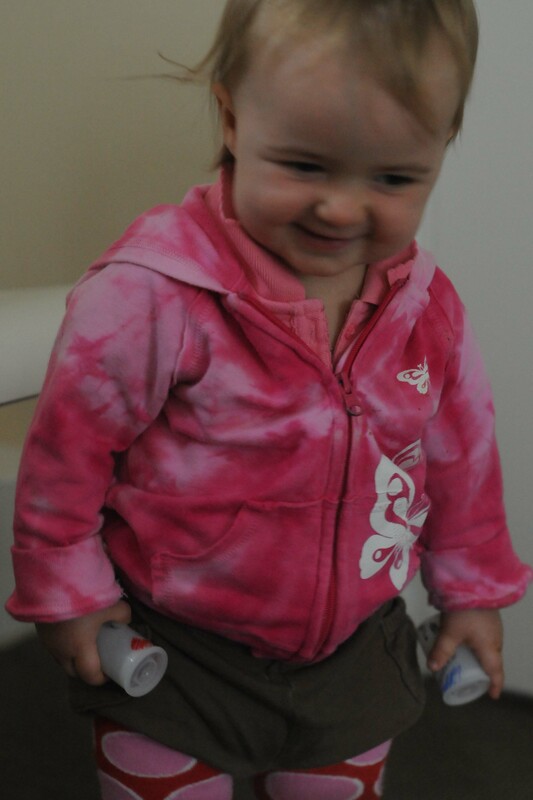 I’ll cover it with some neoprene when she is older. Oh boy, I’ve had the idea for this one for months now. When I first dreamt it up, I had no workshop/tools, but little did I know how much trouble this little beauty was going to cause me!!! 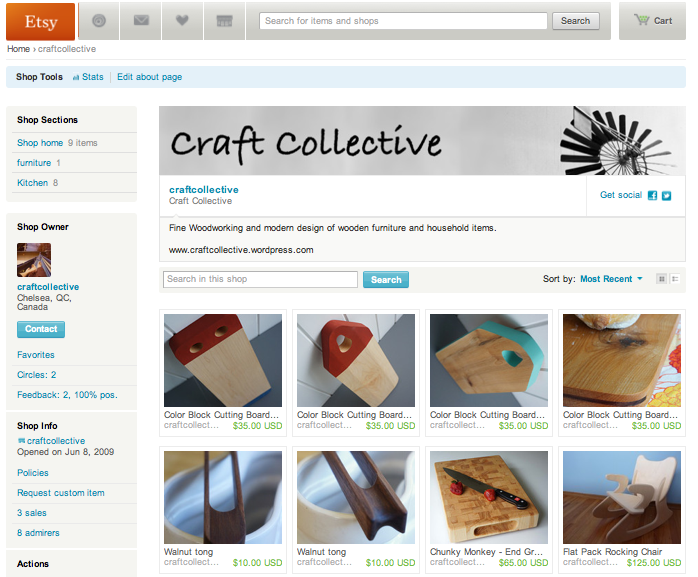 For those of you just joining in, this is week 3 in my 52 Create where I create 52 projects over 52 weeks. First, let me tell you, wheels are not easy to come by. When I was a kid, my dad and I built a soap box car. We went to our local Canadian Tire and picked up some cheap wheels and by the end of the day I was ripping down the hill behind the Parliament buildings. Fast forward 20 years and things are no longer so simple. After visiting several stores, the best I could do were some snow blower wheels which were too heavy, and $10/wheel!!!! You can buy a toy stroller in Paris for $7. I should have bought one before we left and just ripped the wheels off… Anyways, after some ebay searching I ended up ordering 4 scooter wheels from the states. Total cost was $25 including shipping which still seems like a lot for what they are being used for, but in the end I’m happy how they turned out. My daughter loves strollers and at playgroup always finds one to tear around the room with. 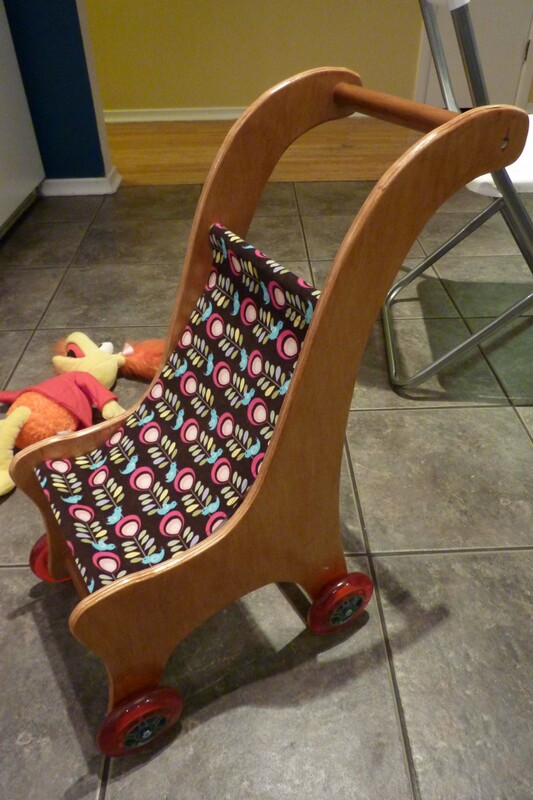 The stroller is made out of Baltic Birch plywood, the dowels are from an old laundry hamper that a roomate broke/left behind. 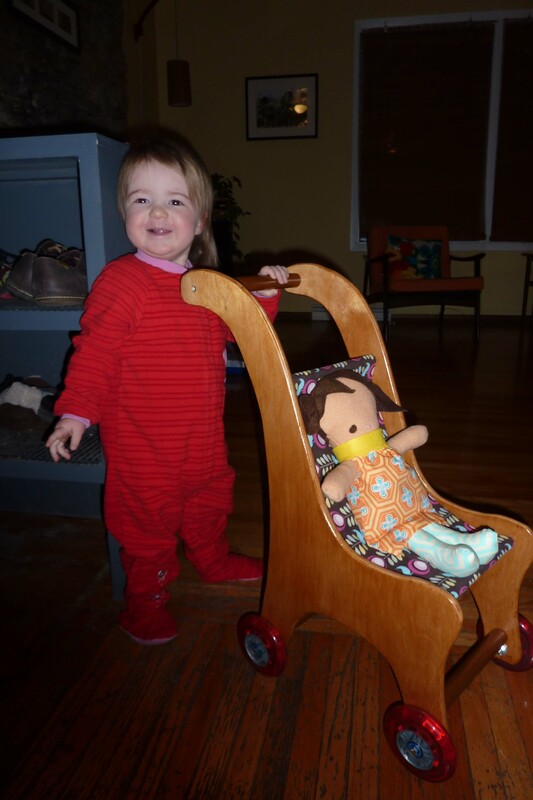 I had my wife sew up the seat from some corduroy fabric (she also made the doll in the picture below). In search of a safe kid friendly finish, I ended up using shellac. It was a bit of a pain as the Lee Valley sells the flakes, but not the alcohol. They also failed to tell me that although it recommends using Ethanol, that isn’t available in Alberta and so you need to use Methyl Hydrate instead. If I had known this at the beginning, I might have saved myself a lot of driving around. Shellac is of course food safe (used to coat M&M’s) and so is a great finish for kids objects. It’s also nice that it has no real smell to it, so I could apply the finish indoors. Shortly after our daughter arrived a year ago, I decided that I wanted to pass my love of craft down to her. While we can’t chose what our kids like or don’t like, we do have some influences, so I thought that I would always make my daughter gifts for her birthdays and Christmas. 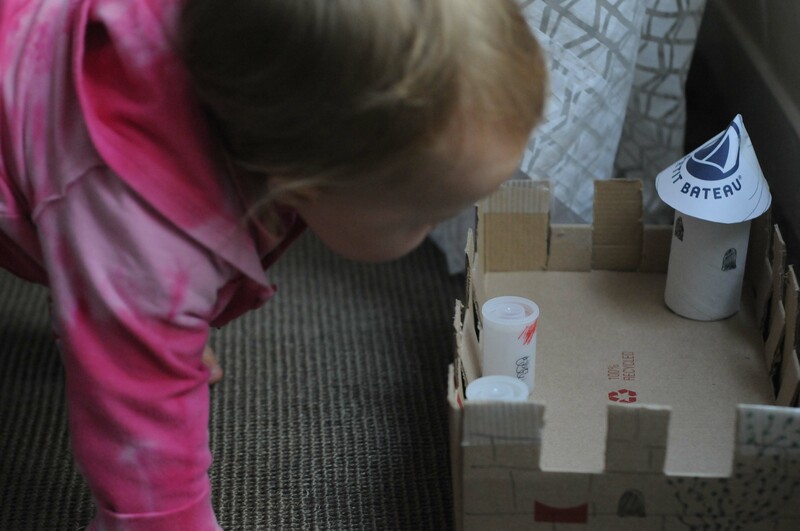 I wanted her to see that toys don’t have to be bought, and for her to understand the time and effort that goes into making toys at home. I realize at one year of age, this is not very relevant to her, but you might as well start off on the right foot. Unfortunately when I made this decision, I was enjoying my full workshop and house full of crafty tools. 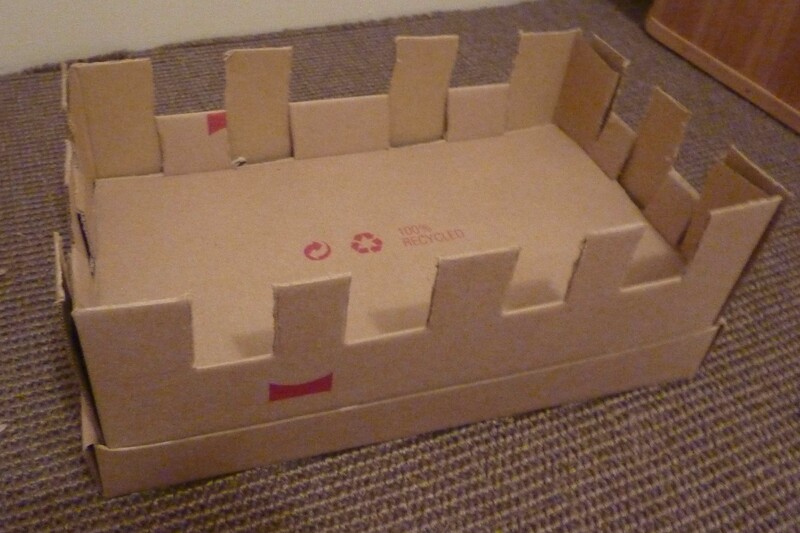 Move ahead one year and I am in Paris in an apartment that is less than 300 sq/ft and my tools consist of a leatherman and duct tape… Being in Europe, I felt a castle was appropriate, while I figured she’d be just as happy with an empty box, I did really enjoy the project. 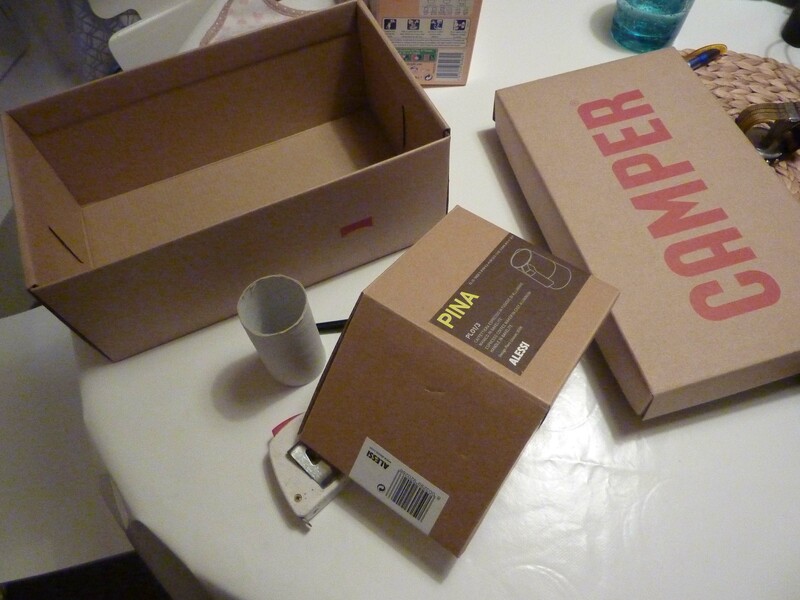 A shoe box was quickly turned into a castle using the leatherman and a small amount of clear duct tape. 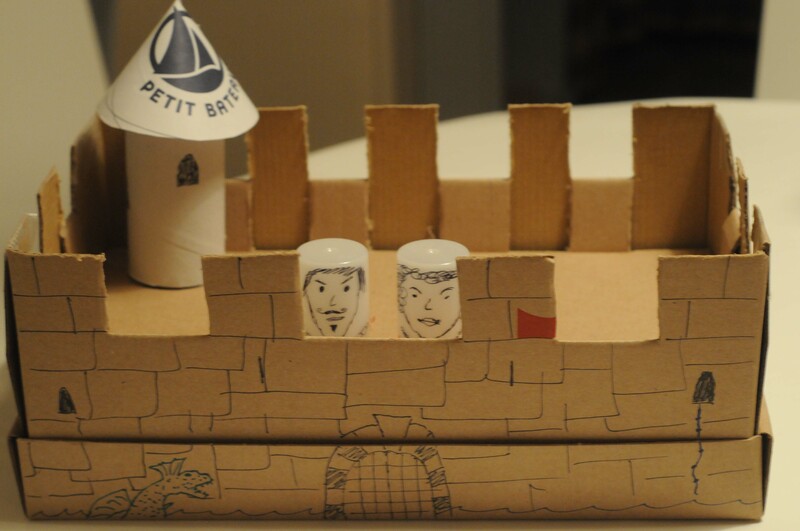 Next a toilet paper roll was attached as a turret, with a pointed roof coming from a paper shopping bag. I decorated the outside walls of the castle with some permanent markers, drawing a dragon, a moat, some trees, and even some ivy growing up the sides. 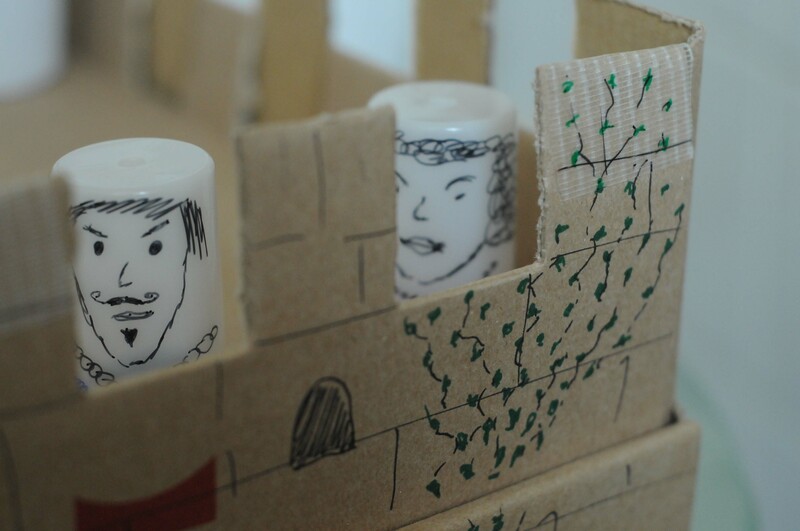 The castle needed a kind and queen of course, and what better thing to use than some empty film cans. 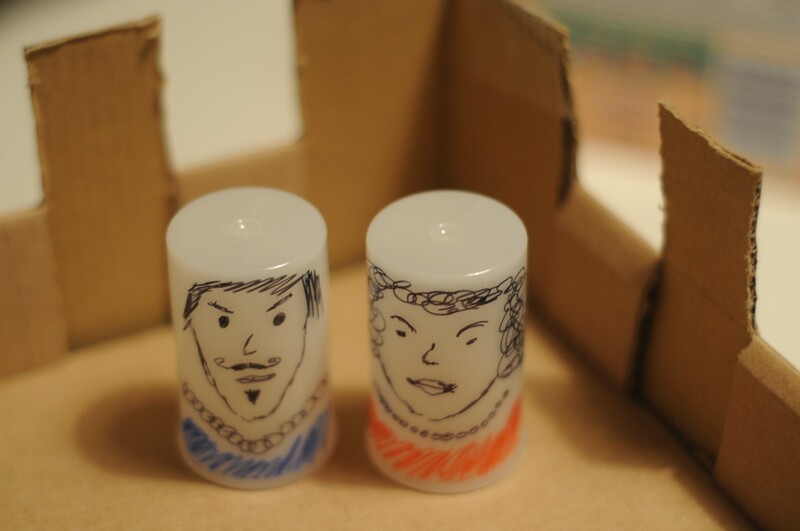 My daughter already loves playing with the film cans, and adding a face to each and throwing a few pennies inside made them all the more fun. After much debate I recently purchased a Macbook Pro and not an iPad. 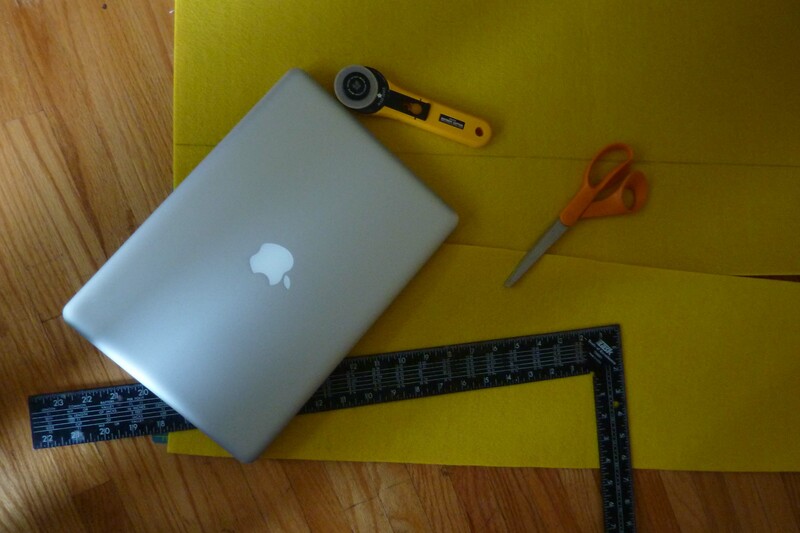 For my last laptop, I had a case made out of orange/yellow velour by C. It was wonderful, but unfortunately a totally different shape than my current Macbook Pro. So while I was at the fabric store searching for felt to repair the light seals on my Yashica TLR, I picked up some very thick yellow felt. 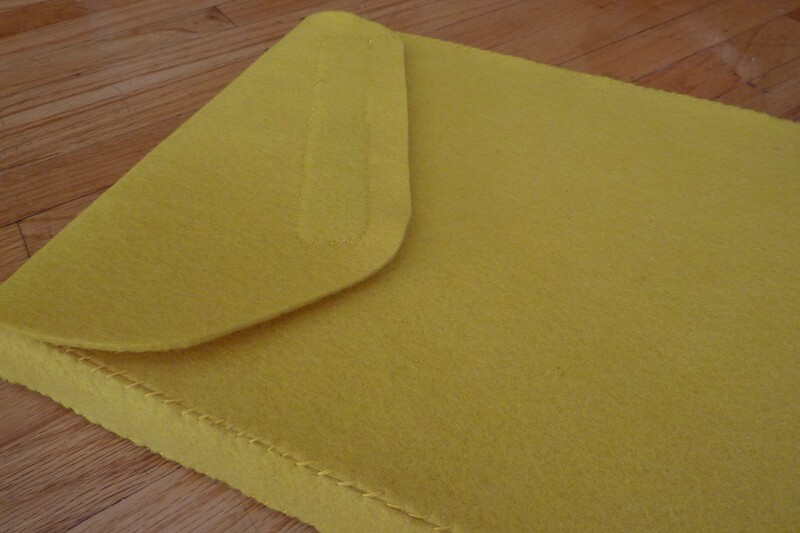 I’d never seen felt like this before, it seemed just perfect for laptop sleeve as it had a bit of padding to it. I grabbed some velcro and some thick yellow thread while I was there as well. Once home I measured out my dimensions and used a rotary cutter and a self healing mat to make the cuts. I decided to you a carpentry square as it was the right length, however it was hard to keep it from slipping on the felt. If you’ve never used a rotary cutter before, let me tell you, this is a great invention. So much easier than cutting straight lines with a pair of scissors. 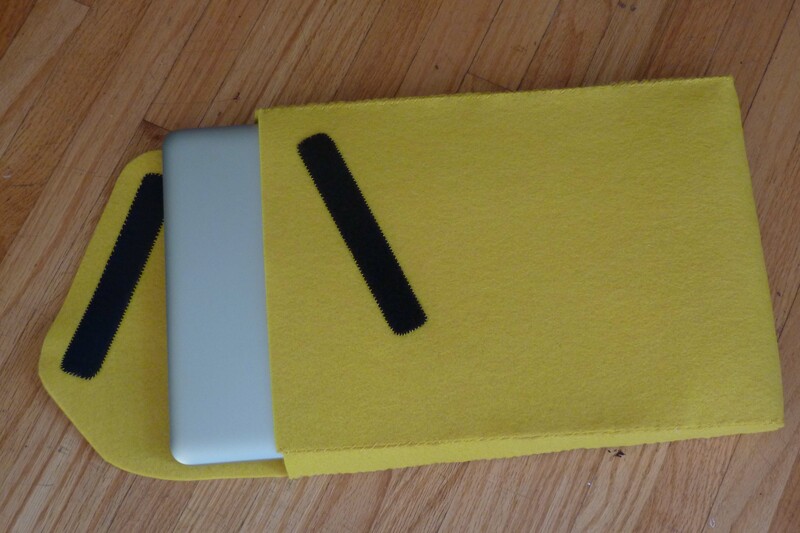 I decided to make the case open on the end instead of on the side like most laptop cases. I figured this way it would be easier to plug it in for charging without taking it out of the case. All the seams were sewn by hand and then a couple of pieces of velcro were used to keep it shut.